I am far from an expert on this case or security in general, but this feels increasingly like a political battle that goes beyond this phone and this case. 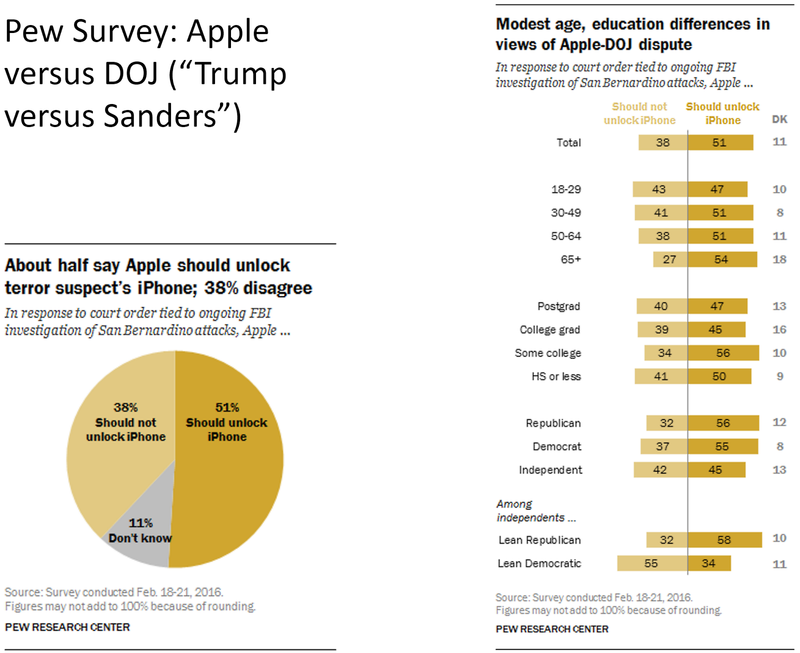 It is an issue between the FBI, which would like to see Congress pass a law to insure "backdoors" on all phones to allow access and decryption and Apple and most other tech firms that oppose such a law. I believe both sides are sincere. The FBI believes they could better guard us against terrorists (and drug dealers and other criminals) if they could get a warrant to search any phone, as they can a car, home, etc. Apple believes that since the US is the current world leader in encryption technology, we are better off without such backdoors because the "keys" would be discovered by others and other governments, for example the Chinese, might press for backdoor access in selected cases. (Apple has also invested a lot in a pro-privacy marketing image). There is no obvious correct answer and there will be unintended and unforeseen consequences regardless of the outcome. Only one thing is clear -- this is not a matter that should be decided by supporters of Donald Trump or Bernie Sanders or Hillary Clinton. Sci-Hub is a Russian site that seeks to remove barriers to science by providing access to pirated copies of scientific papers. It was established in 2011 by Russian neuroscientist Alexandra Elbakyan, who could not afford papers she needed for her research. She was sued by Elsevier, a science publisher, and enjoined to shut the site down, but she has refused to do so. The site claims links to over 48 million journal articles, so I decided to try it out by searching for the title of an article I had just read: "A technological overview of the guifi.net community network." The paper was published by Elsevier and costs $35.95 to download if you are not from an organization with an Elsevier account. After the captcha, it retrieved a PDF file with the full article as it had been published. The site is inconsistent. I tried it for a couple of the articles I have published in the Communications of the Association for Computing Machinery (ACM), which are online behind a paywall. 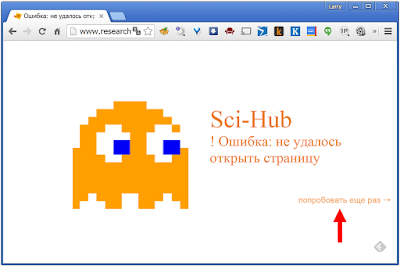 It found the Google Scholar references, but was not able to retrieve the articles. However, it was able to retrieve some of my ACM articles that other people had managed to liberate and post on their own Web sites and it found drafts that are on my Web site. It must do a Google Web search as well as call on Google Scholar. 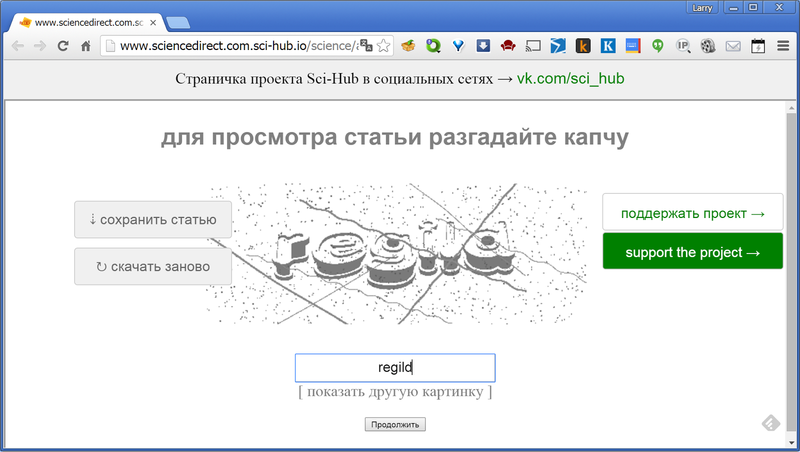 The best way to use Sci-Hub is to find the Digital Object Identifier (DOI) of the publication you are looking for before you go to Sci-Hub. The DOI is a standard, persistent identifier of scientific paper or other digital object and, if you have it for the paper you are seeking, you can simply enter it into the search box on the Sci-Hub home page. Many publishers and organizations assign DOIs to their material and you can often find them in databases like PubMed or on the Web sites of the publisher, like the ACM Digital Library. 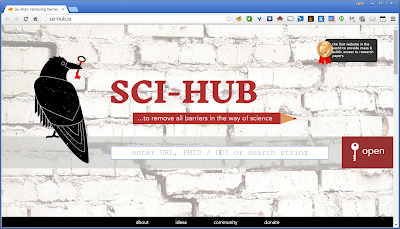 Sci-Hub openly violates copyright law, is slow and clumsy to use and the access is inconsistent, but what alternative does a researcher in a developing nation or at a relatively poor university or other organization in a developed nation have? There are a number of open scientific publication sites, and my guess is that they will prevail in the long run, leading publishers like ACM and Elsevier to change their business models. But that is just a guess. One can also imagine a world in which copyright law makes fair use exceptions for scientific research, as opposed to entertainment. I don't feel guilty about pirating a scientific paper, but am happy to pay to see Star Wars. Finally, after visiting this site, one cannot help thinking of the case of Aaron Swartz, who committed suicide as a result of prosecution for his attempt to free scientific literature.